The seventies and eighties were wonderful decades for Scottish marathon runners – wherever you lived in the country, there was sure to be a marathon near you! And the SAAA Championship was a dedicated race held in the Scottish Championships. The Aberdeen Marathon was one of the best of these and Colin Youngson has written the following portrait of the race. Despite the efforts of the incorrigible Alastair Wood and his staunch training partner Steve Taylor, who inspired many Aberdeen AAC runners to do well in the Scottish Marathon Championship, the Shettleston Marathon and other marathons in England, Europe and beyond, there was no post-war local full-distance marathon event, although there were plenty of long training races (from 10 miles to 21 miles) in the North, East or West of Scotland. And in fact every Sunday run with Wood and co was a race! 4 John Bigham (RAF Cosford) 2.28.00. 1st Team: AAAC; 2nd ESH. 2nd Elin Abom (Sweden) 3.55.08. Leslie, of course, was the London physiotherapist, originally from Glasgow, who became an iconic figure in British marathon running, completing an amazing 206 marathons. She was Scottish marathon record holder and in 1981 set a world record for fifty miles in Connecticut, USA. Google Leslie Watson for more impressive achievements. 1 England; 2 Scotland; 3 Wales; 4 N. Ireland. A brilliant run by the youthful newly-crowned Scottish Marathon Champion, Graham Laing, who outclassed the experienced 1970 Commonwealth Marathon bronze medallist Don Faircloth. Graham’s time, on the same exhausting course as before, was an excellent one. The P and J reported: “Early on, Laing forged ahead of Bolton’s Mike Critchley the leading Englishman, and after ten miles had a 45 second advantage, which had become 2 minutes 18 seconds by 20 miles. He broke his own course record and reduced his personal best by 2 minutes 7 seconds. A well-judged race was run by Don Faircloth of Croydon, who moved from 6th in the second lap to second at the finish.” Recently crowned World Veteran Marathon Champion Don Macgregor was a long way in front of his M40 challengers. 1st England; 2nd Scotland; 3rd Wales. Priscilla went on to become one of the greatest veteran marathon runners. Her peak performances included: sixth in the 1984 Los Angeles Olympics; and at the age of 42, second in the London Marathon (2.26.51) and first in the New York Marathon. This race took place in cold gale-force winds and driving rain. The new course finished in one of Aberdeen’s lovely grassy areas: Duthie Park. Before that, starting opposite the Beach Ballroom, it looped round Union Street, Riverside Drive and the harbour, then up the Esplanade and back down King Street, Riverside Drive, Holburn Street, Great Western Road, North Deeside Road, Maryculter Bridge, and the South Deeside Road. Fraser Clyne was making his marathon debut and ‘went for it’ at 17 miles. Unfortunately, having pulled away, he ‘hit the wall’ and struggled home fourth. Max Coleby, an experienced GB international runner from the famous Gateshead Harriers, squeezed home after an exciting sprint against his team-mate Martin Knapp. 1 Wales; 2 Scotland; 3 England; 4 Northern Ireland. This race must have been a real tussle! The route started on the Beach Boulevard, and then went down Union Street, Riverside Drive, past the harbour, up the Esplanade, King Street, Market Street, the harbour again, Riverside Drive, Holburn Street, Great Western Road, North Deeside Road, Maryculter Bridge, South Deeside Road, Riverside Drive, the harbour and finished next to the Beach Boulevard. 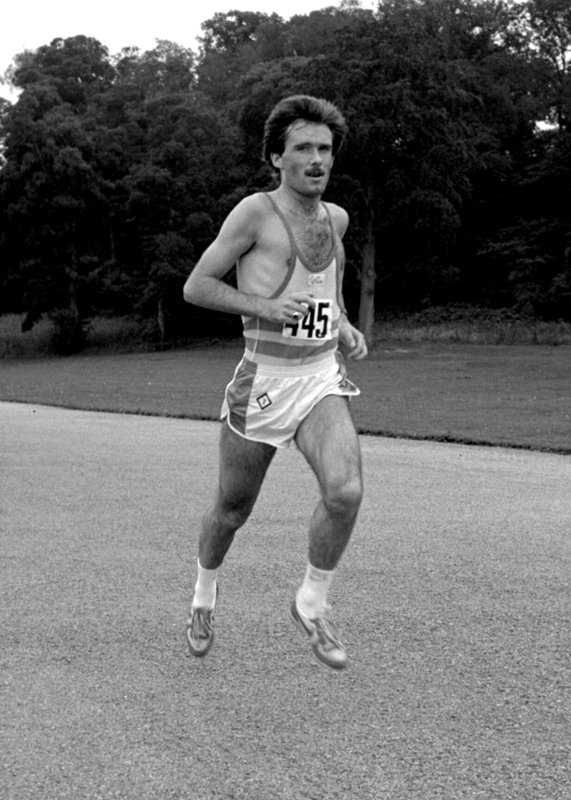 Gerry Helme, from St Helens on Merseyside (who went on to run a wonderful 2.10.12 in the 1983 London Marathon) had recorded the fastest-ever time on the fastest course for the Aberdeen Marathon. Ieuan Ellis was seventh (2.15.12) in the 1986 Edinburgh Commonwealth Games and recorded a personal best (2.13.21) in that year’s Beijing Marathon. Fraser Clyne lost three minutes to Ellis in the last three miles. However he soon became one of Scotland’s best-ever marathon runners, with a 1985 PB of 2.11.50 when he was second in the US Marathon Championships in Sacramento. Jim Ash – an extremely durable athlete – for several years lived in Peterhead and worked as a fire and safety officer with Shell Expro at St Fergus gas terminal before being transferred to Fife. 13 Alastair Wood (AAAC) 2.31.48 1st M50! 1 England; 2 Wales; 3 Northern Ireland. Marriage obviously suited the former Lynda Stott’s rapidly improving marathon form. The quietly –spoken librarian, who only started running in 1981, had fitted in seven marathons before this one, when she won a gold medal in this, the very first Scottish Women’s Marathon Championship. Jacqui Hulbert had made a bold attempt to retain her title but tired badly with four miles to go. Lynda Bain surged past to secure a clear victory. Previous winner Graham Laing (Scotland) tried to break the field and was two minutes clear at 14 miles. However he had underestimated the effect of running alone into powerful winds (which blew down the Press tent) and dropped out at 18 Miles, shortly after he was passed by a more cautious pack of three Englishmen, a Welshman and a Northern Irishman. Kevin Johnson, a 25 year-old Geordie from Elswick Harriers, finished most strongly. Local Hero Alastair Wood broke the M50 record by twelve minutes. Scottish Marathon Champion Peter Wilson was awarded the A.J.M. Edwards Trophy for the leading AAAC runner and, as first finisher from the North-East, won an all-expenses-paid trip to the following April’s Milk Run in Boston USA! Sadly, this proved to be a one-off prize. 11 1st Team: England; 2nd Team: Scotland; 3rd Eire; 4th N. Ireland. 2400 entered the race but only 1313 actually ran. Lynda made a rapid start to defend her Scottish title. She took three minutes off Leslie Watson’s Scottish Native record. This was Lynda’s seventh PB in ten marathon outings. 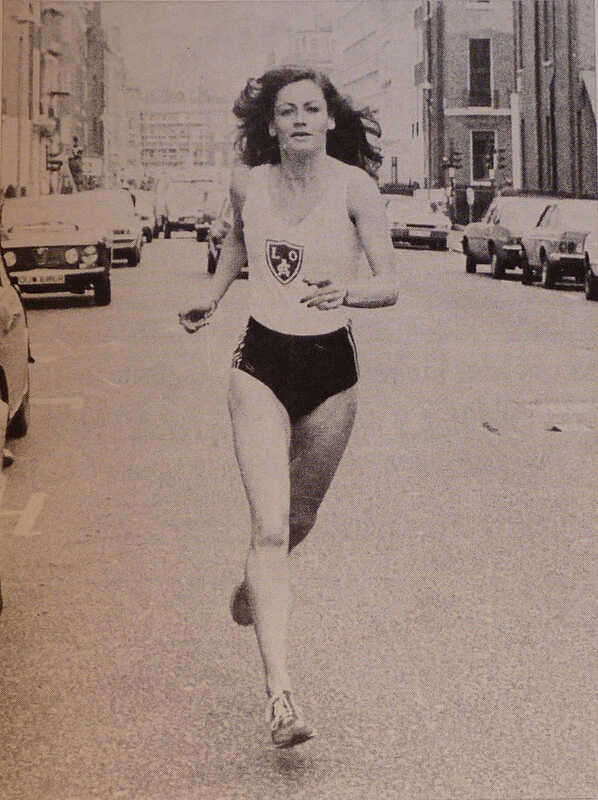 After representing GB in the 1984 Kosice Marathon in Czechoslovakia, she went on to improve to an excellent 2.33.37 (another Scottish record) when seventh in the 1985 London Marathon. Sadly injuries prevented further progress. My diary states: “Dull, overcast day, bit of a breeze, drizzle sometimes. Off fastish up the prom but the pace slowed into the wind and a big pack of 18 stayed together to 10 miles (very slow 55 minutes). Pushed up the hills from Garthdee and six got away. Hung on along the North Deeside Road but after Milltimber Bridge, the rest escaped on the South Deeside Road. Lost a struggle with Colin Brown and then had to fight hard to keep clear of Noel McEntaggart. Could have been worse. Respectable at least.” Up front, George Reynolds (originally from Kinloch Rannoch) and Charlie Haskett (from Dundee) were leading at 20 miles when they heard the fateful patter of large English feet, as Mark Burnhope, a 24 year-old from Wolverhampton, loomed alongside and before long moved away for victory. George just managed to hold on to second place at the Beach Boulevard – and was rewarded with a gold medal in the Scottish Marathon Championship, which was reserved for Scots only on this occasion. English-born Dr Ann Curtis raced away with the Scottish Women’s Marathon title. First native Scot was Janine Robertson, who won a trip to New York in what was only her second marathon. 248 finished a difficult course on a very windy day. Stephanie Quirk, a 29 year-old physiotherapist, won the Scottish title, knocking nine minutes of her previous best. She was based in Kendal and enjoyed some success as a fell runner. She finished well clear of Janine Robertson and Morag Taggart, who pocketed her third championship bronze in four years. Ray Maule, a 32 year-old planning engineer who ran for Coventry Godiva Harriers, made his move at 21 miles. Neil Featherby from Norfolk was next; and then Kevin Best, a fireman based at RAF Buchan. Colin Youngson, who had won the Dundee Marathon only four weeks previously, was dropped at seventeen miles and struggled towards the end. Allan Adams, a late replacement in the Scottish team for Dave Clark, finished very strongly to claim the veteran prize. 12 1 England; 2 Scotland; 3 Wales. There was no shortage of drama in this race. Welsh athlete Sue Graham had built up a big lead when she keeled over at the 22 mile point and had to be rushed to hospital with exhaustion. 23 year-old Carol-Anne Gray just managed to overhaul Margaret Oliver to win the Scottish title by fourteen seconds. 1st Team: Scotland; 2 Wales; 3 England. This time, Sue Graham ran well all the way to the finish but had to be content with second as Eileen Masson stormed home for an impressive victory in the Scottish Women’s Marathon Championship. By twelve miles, Hammy and Frank Harper from Pitreavie had dropped Dave Jenkin. They reached halfway in 69.20 and at 14 miles outpaced Owen Lewis. Then Cox moved away at 18 miles to a clear victory over his hard-training team-mate. Alan Robson paced himself well to be the first club runner home in third. Jenkin made up for dropping out the previous year, before Buckie’s Doug Cowie, an RAF runner, wrapped up the international team honours with a strong finish in fifth place. 1st Team: England 13 points; 2nd Team: Scotland 14 points; 3rd Wales. Liz Hughes, a 32 year-old university geography research officer, won Scottish gold in a time that knocked 12 minutes off her previous best, set when winning the Welsh title on her marathon debut at Bridgend in 1987. Margaret Stafford set a PB in winning a silver medal, while Linda Trahan took twenty minutes off her previous best, set just four weeks earlier at Lochaber. Ian Bloomfield became Scottish Marathon Champion; Terry Mitchell claimed silver; and Mick McGeoch (the most cheerful Welshman ever) won bronze. 1st Team: England; 2 Wales; 3 Scotland. Liz Hughes successfully defended her Scottish title with another personal best time, while local runners Diana Jermieson and Joan Molloy took home the silver and bronze awards. The first three won the medals in the Scottish Marathon Championship. This was to be the final Aberdeen Marathon, a well-organised and challenging event not only for local runners but also for many visitors. The Home International series brought good class runners from all over Britain; many fine performances were produced; and competitors enjoyed excellent hospitality, mainly funded by the generous main sponsors: Aberdeen City Council and especially the Aberdeen and District Milk Marketing board. Happy memories!